Think you’ve got nothing to wear to that cocktail party coming up in a few days? Step inside your closet and think again! It’s time to put a little spin on your holiday wardrobe and come up with a remix of festive favorites. Steal the spotlight with a new twist on the classics. Christine McElroy has a story to tell. And it’s not your typical baby delivery tale, comparing notes with other mothers who have lived through the agony of labor. Christine has a harrowing story. When delivering her first child, almost three years ago, she nearly died when her uterus tore, resulting in severe internal bleeding that required emergency surgery. Through her faith in God, a loving family, a medical staff she describes as “amazing,” and the largesse of the Blood Alliance, Christine made a full recovery. 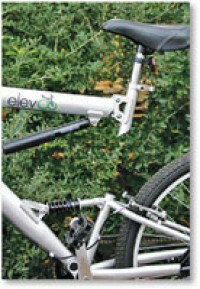 We're Giving Away an elev8 Bike! The Pink Magazine team was given the opportunity to test the elev8 Bikes. We loved them so much, we have teamed up with elev8 to give away a bike to one lucky reader. The field includes fifteen others, including Nirvana, LL Cool J and Linda Ronstadt. Half of those nominated have been nominated before. For the second year, fans also can vote at rockhall.com and the top five fan favorites will count as one vote, in addition to the votes of 600 artists, music industry professionals and historians. Inductees will be announced this month, and there will be a ceremony held in April that is scheduled to be televised in May. n old town Bluffton, nestled among the natural beauty of the Lowcountry, history flirts with the vibrant and new. Every Thursday on Calhoun Street, from 2:00 to 7:00 P.M., locals and tourists alike gather to browse and purchase the freshest, locally grown fare, from fruits and vegetables, to flowers and herbs. Ranking as the number one Farmer’s Market in South Carolina, the Bluffton Farmers Market is really more than just the phenomenal produce it boasts week after week. It also offers delicious prepared food, live entertainment, educational programs and an opportunity to make new acquaintances, as well as visit with old friends. December in the Lowcountry brings on a flurry of holiday activity and the denouement of our entertaining season. Welcome to the whirlwind of the holidays: those last minute dashes to the store for gifts, cocktail parties as we deck the halls, and the sounds of jingle bells ringing in the cold winter air. This is a story that’s hard to share, but only because it means so much to me. And I want to preserve it’s memory with the meticulousness of mummifying a great Egyptian Prince. Sometimes, in sharing, I feel like I lose my sense of ownership-like someone might take or change my memory. But this story is meant for here. God was meant for such glory.